I know ever since Scharnhorst among other ships got pulled from the shop there have been people asking about them. And just in case anyone has missed the patch notes. The Scharnhorst and few other ships will be in the shop tomorrow just in time for use over the Summer. Really such a sleek beauty and a Queen at her tier. I like mine. It's not astounding, but it's fun to play. Weird that it's just Yubari leaving. AA and happy meal deal game too strong. Or, you could always buy it and play it in Co-op until you have T7 BBs and a bit more experience. That way, you have it, if it goes off sale again. Wait! Okhotnik returns? Seven (7) cruiser guns on an incredibly low DD chassis... Oh, did I forget to mention the twelve (12) torpedoes it can launch at once? Yes, they only go 4.5 km but it is glorious when you have a chance to use them. Sorry. I just thought WG would never sell Okhotnik again. Lol don’t worry I can’t afford to the cost to buy a Scharnhorst, despite the fact I could probably make very good use of her since I have a ton of battles logged in mid tiers and high tiers in various ships including Gneisenau and Graf Spee which Scharnhorst is pretty much a combined version of the 2 ships. I do enjoy using the arch enemy of Scharnhorst, the Duke of Yourk lol. Scharnhorst is NOT an over-powered, pay to win, monster must have. She has several real weaknesses, especially for a battleship. Don't let forum and/or in-game hype lead you astray. Having said that, Scharnhorst is as close to a must-buy as you can get. "Wait, WUT?!? But you just said...!?!" Indeed, I did. My warnings stand. What I have not yet mentioned is that despite her weaknesses, Scharnhorst is simply damned fun to play. In that regard, believe ALL of the forum and/or in-game hype. The enjoyment may well lead you to play a lot of games with her. If you do that, you will likely learn to maximize her strengths, hide her weaknesses, and become a terror of the seas. She is capable of doing that for you. But, you have to learn how to do it. Scharnhorst makes that learning process darned easy/fun. 10/10 on the recommend scale, and for all of the right reasons (Belfast and Kamikaze would also be on the 10/10 scale, but for all of the dirtiest reasons!). 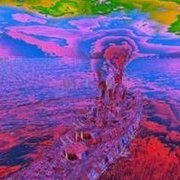 I agree, it is a beautiful and elegant ship to see sailing across the waves. Yes right up there with the Atago and Graf Spee. Right now there's really not much else to cut. 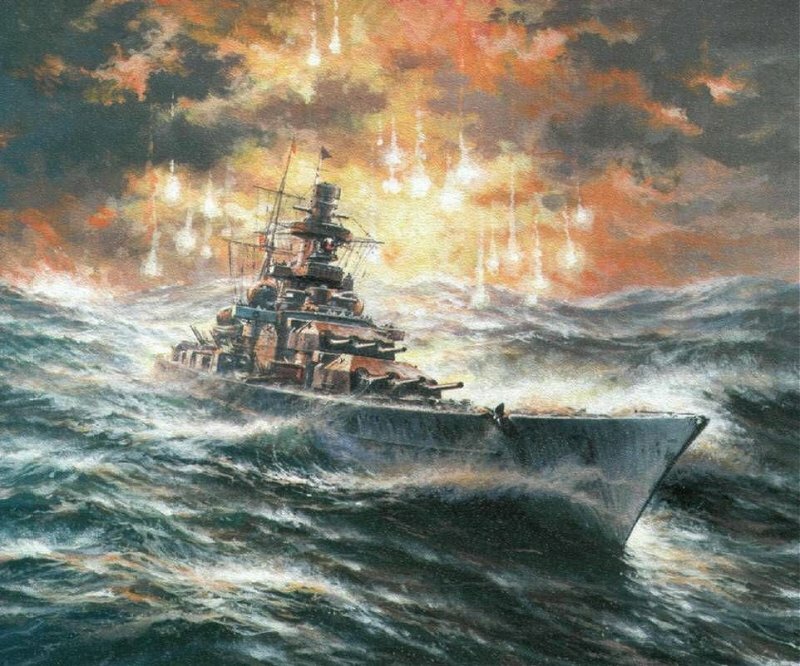 After reading some of the things you said about why you don't play the Soviet lines for the commander mission, I'm surprised you play German ships (or Japanese). Figured you'd stick with just the good old allied ships. Lol not sure where you got those ideas, I play the high quality quality naval nations like Britain, US, Germany, Japan, and France. And most of what I use is Japanese followed by Germany. 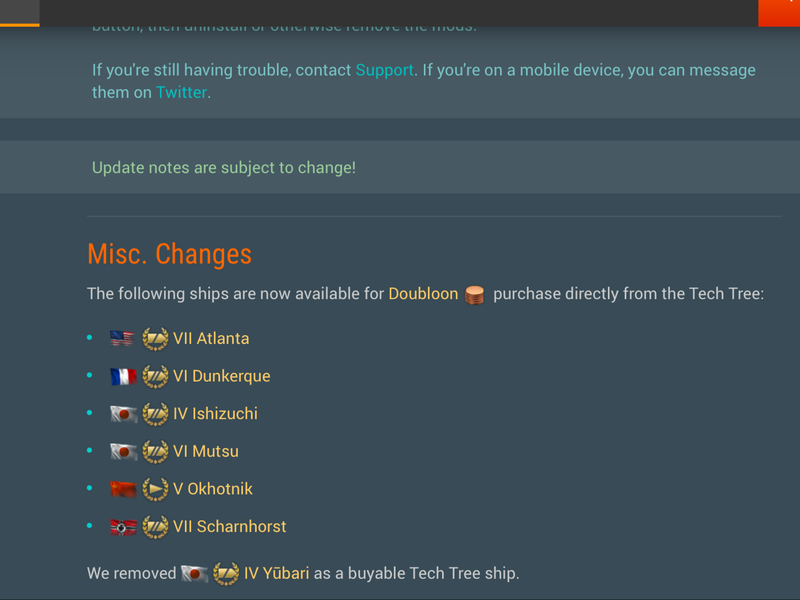 While some of these may wind up in the Premium shop (Dunkerque has been there for a while now and still is as of right now) that notice is saying those ships will be available through the tech tree for doubloons. It doesn't say in the shop. Just clarifying so people know where to look "IF" they aren't in the shop too. Costs? I have the Scharnhorst, okhotnik, and the dunk, but would seriously consider spending some dub's for the Atlanta is it reasonably priced? Love the Scharnhorst and the OK is fun as heck, not a big fan of the Dunk though.. 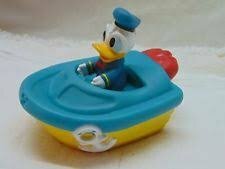 They want 9k doubloons for it, even with cheap doubloons bringing it under $20, not sure it's worth it. That sums her up perfectly. Yeah those 11’ guns are fun. While not exactly the same as my Graf Spee guns, they are very similar since Graf Spee is the predecessor of Scharnhorst class. Was just looking at Scharnhorst in Port shop and noticed something interesting. 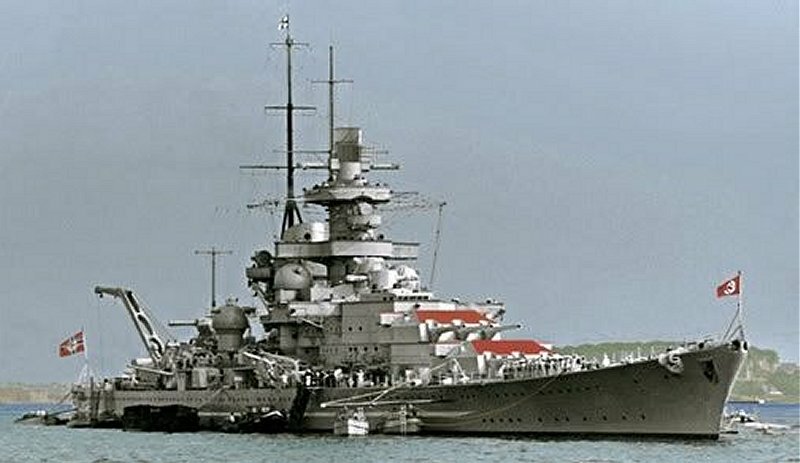 If you compare the the Scharnhorst and the Graf Spee from the sides and even head on they do share interesting resemblance from the main turrets, some of the secondary guns, and some of the super structural elements as well. Gneisenau moves far enough away in its changes that it makes it more of Bismarck / Scharnhorst Hybrid. But looking at Scharnhorst after doing a lot of research of history of Graf Spee and using Graf Spee a lot I see the similarities Scharnhorst has now. I have the perfect tier 1 Duck League BB for them.